Next in The Carpetology Wear-Dated Website Guide: The Carpet Catalog, Part I. The Wear-Dated Carpet Catalog allows you to easily browse through carpet styles, and the colors available in each style. 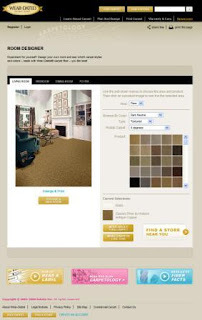 From the Wear-Dated Home Page, simply click on any of the Featured Carpet Styles. From anywhere of the website, reach The Carpet Catalog from the drop down menu, under Find Carpet. You can also enter a specific carpet style name in the search box [top right hand corner of each page]. As in a carpet retail store, we use a 'deck board' format where critical information about the carpet is readily available and visible in one location: the carpet style name [in my example, it's Marciano], the name of the carpet mill that created the carpet [here, WundaWeve], the name of the color shown in the large swatch, the Fiber Line - i.e., the type of Wear-Dated carpet fiber [here: DuraSoft. This link takes you to a listing of all of the Wear-Dated carpet fiber types available], a description of the carpet style [here a shag], and a durability ranking for the style. Durability Ranking corresponds to the Wear-Dated® performance rating we get when we test carpet samples. It is based on an international test method known as Hexapod which evaluates appearance retention of carpet. The instrument used to test carpet is composed of a circular rotating drum with carpet placed on the inside. Also placed inside this drum is an eight-pound steel ball with six pods [hence the name 'Hexapod']. As the drum rotates, the ball falls on the carpet face, simulating footsteps.After the standard number of rotations, carpets are then assessed using the Carpet & Rug Institute [CRI] performance rating scale. The lowest rating of 1 means “severe change in appearance” and the highest rating of 5 means “no change in appearance.” Note that these ratings do not take into account soiling, poor maintenance or other factors of use; just the change of texture related to matting and crushing that might occur from walking on it. For these reasons, it is not practical to associate years of wear with the performance ratings. The virtual carpet deck board allows you to easily evaluate carpet colors in the larger swatch format [in-store, the large swatch is often beige and the color line shown in small swatch sizes], and page back and forth from color to color. Or, simply select the one you like from the thumbnail choices. The Carpet Catalog offers another benefit: visualizing the carpet in a room to better evaluate how it might look with furniture and in combination with different wall colors. So, from The Carpet Catalog, look for "See This Carpet In A Room" and you will be taken to the Room Designer where you can let your imagination run wild! When you reach the Room Designer from the Carpet Catalog, it will automatically take you to a room with your carpet. However, if you don't like the room category choice, you can pick another [living room, bedroom, dining room, foyer]. Each category includes several individual room choices. You can also enlarge the room scene and print it. Or choose a new room. We offer the option to return to the Carpet Catalog via "More About This Carpet" or to consider other similar carpet styles via "More Carpets Like This." And, if you're ready, we'll take you to the Retailer Locator! Back to The Carpet Catalog. If you've decided you just don't like the carpet style in front of you, click on "More Carpets Like This" and you can choose from many others. Or, simply Find a Store Near You! Next: Carpet Catalog II, where I will discuss comments and ratings, as well as the other options we offer in The Carpet Catalog to help you find the right carpet style. 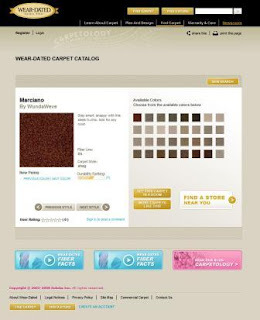 Other posts in The Carpetology Wear-Dated Website Guide series: The Carpetology Wear-Dated Website Guide: Home Page.